A sparkly Sunday we are having today here at Luxarazzi. The jewel of the day is Princess Olga of Greece's Boucheron Diamond Tiara, the only tiara of the last four of the Liechtenstein Tiara Championship we haven't covered in-depth yet. Despite what the name we have given it suggests, the tiara didn't actually start out with Princess Olga of Greece though. The tiara was made in 1907 by Basset for Boucheron for Russian noblewoman Princess Maria Pavlovna Abamelik-Lazarev, daughter of industrialist Count Pavel Pavlovich Demidov and wife of archaeologist Prince Semyon Semyonovich Abamelik-Lazarev. Having no children of her own, she gave the tiara to her nephew Prince Paul of Yugoslavia, son of her sister Aurora. Prince Paul acted as a regent during the years of minority of King Peter II, a son of his cousin. In 1923, Prince Paul married Princess Olga of Greece and Denmark, a sister of Marina, Duchess of Kent. It was her the tiara, made of white and yellow diamonds set in a floral design, is usually named for. 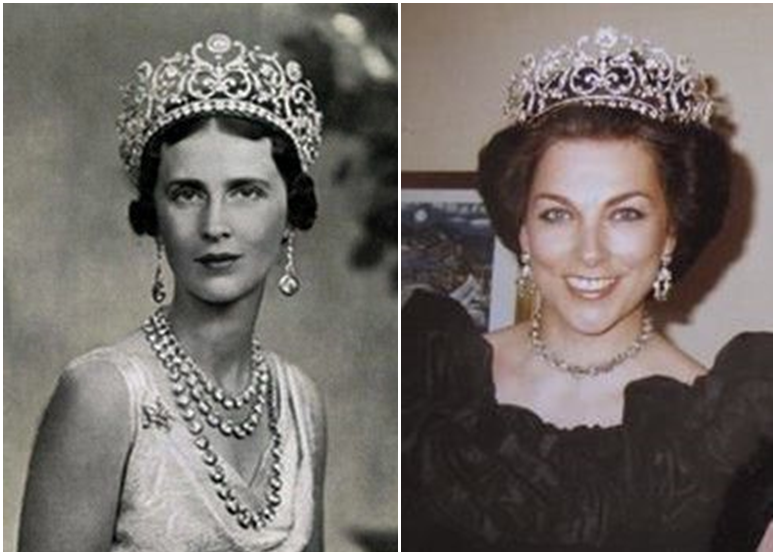 It was also Princess Olga who added a diamond riviere to the base of the tiara making it appear more substantial. After Princess Olga's death in 1997, her oldest son Prince Alexander inherited the tiara. His second wife née Princess Barbara of Liechtenstein had already previously worn the tiara for a number of events. As pretty as they are, sadly tiaras won't keep you warm in the middle of the night and thus Prince Alexander and Princess Barbara sold the tiara reportedly to purchase a home for their only son, Prince Dushan. 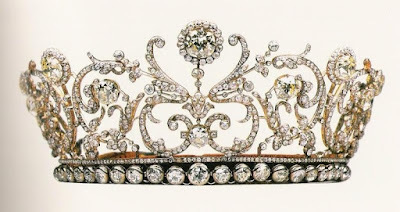 The tiara was purchased by the Albion Art Collection of Tokyo and is now regularly being exhibited.